I miss God’s goal (aka sin). There is a penalty for that. Unless … I am forgiven. So there is great news! 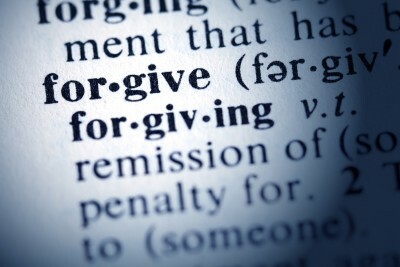 Forgiveness in the Bible is a “release” or a “dismissal” of something. The forgiveness I have in the Messiah involves the release from God’s just penalty and the complete dismissal of all charges against me. “Therefore there is now no condemnation for those who are in the Messiah Jesus.” (Romans 8:1). The Amplified Bible translates the last phrase like this: “the forgiveness of our sins and the cancellation of sins’ penalty.” God’s gracious forgiveness of my sin is to be the measure of my gracious forgiveness of others (Ephesians 4:32). Romans 5:8 — But God demonstrates His own love toward us, in that while we were yet sinners, the Messiah died for us. 1 Corinthians 13:4–5 — Love is patient, love is kind and is not jealous; love does not brag and is not arrogant, does not act unbecomingly; it does not seek its own, is not provoked, does not take into account a wrong suffered. Psalm 86:5 — For You, Master, are good, and ready to forgive, And abundant in loving kindness to all who call upon You. Psalm 130:3–4 — If You, Master, should mark iniquities, O Master, who could stand? But there is forgiveness with You, That You may be feared. Micah 7:18 — Who is a God like You, who pardons iniquity And passes over the rebellious act of the remnant of His possession? He does not retain His anger forever, Because He delights in unchanging love. Romans 15:7 — Therefore, accept one another, just as the Messiah also accepted us to the glory of God. 2 Corinthians 2:5–11 — But if any has caused sorrow, he has caused sorrow not to me, but in some degree—in order not to say too much—to all of you. Sufficient for such a one is this punishment which was inflicted by the majority, so that on the contrary you should rather forgive and comfort him, otherwise such a one might be overwhelmed by excessive sorrow. Wherefore I urge you to reaffirm your love for him. For to this end also I wrote, so that I might put you to the test, whether you are obedient in all things. But one whom you forgive anything, I forgive also; for indeed what I have forgiven, if I have forgiven anything, I did it for your sakes in the presence of the Messiah, so that no advantage would be taken of us by Satan, for we are not ignorant of his schemes. Ephesians 4:32 — Be kind to one another, tenderhearted, forgiving each other, just as God in the Messiah also has forgiven you. Colossians 3:13 — Bearing with one another, and forgiving each other, whoever has a complaint against anyone; just as the Master forgave you, so also should you.